DELHI, INDIA, April 2, 2019 /EINPresswire.com/ -- Cost effective quality on time delivery! Have you heard this phrase before? In project management 101 classes around the world we are all presented with a triangle and at each of the points in the triangle we see the words cost, quality and time. In recent times I have also seen scope, expectation etc. introduced to the triangle with the words Quality now sitting central to cost, time and scope. This makes a lot of sense to me. I am a seasoned program manager with experience in project management methodologies such as PBOK, Prince2, Agile working for over two decades in the engineering, information technology and education industries. I believe without Quality in the centre the Project Management triangle, contrary to the view that any structure requiring a strong and rigid construction depends on a triangle to achieve that goal, the Project Management Triangle will collapse without Quality! This is where ISO9000 family of quality management systems standards introduced in the 80’s comes into play and where organisations seek certification and maintenance of certification while meeting statutory requirements related to a product and/or service. The organisation ultimately guarantees they can meet the growing needs of their customers and other stakeholders. Girikon’s value proposition is clear, the team as a whole from management down to consultants are committed to providing competitive pricing by working efficiently to provide a low-cost service. The team has provided “fit for purpose” solutions which translates to a quality delivery and exceptional customer experience with proof points along the way in terms of positive client testimonials. Girikon values its people which provides the foundation, the processes which demonstrates our discipline and invests in training so that it keeps ahead of cutting-edge technology trends. Girikon is a Salesforce Silver Consulting, Oracle Gold Partner, Microsoft Silver Application Development Partner and Abode Technology Partner and recently updated their credentials for ISO 27001 and ISO 9001:2015 which gives its clients the peace of mind when it comes down to Data Security and reinforces its Quality credentials. In addition to supporting most of the latest technology platforms Girikon provides addition boutique services such as Data Management, Data Mining and Artificial Intelligence. 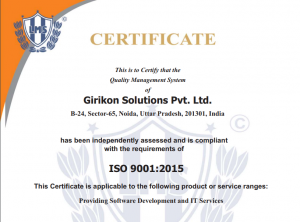 ISO 9001:2015 provides Girikon’s clients a commitment to the implementation of the standard, ongoing requirements and a Quality Management System which is effective. Girikon’s people, processes and technology are supported by a Quality Management System which was recently put to the test with the external ISO 9001 audit and provides the confidence that Girikon can reliably achieve expected outcomes effectively and efficiently. Girikon is now global with its new offices in Melbourne, Australia and continues to deliver quality outcomes with a well-trained, experienced and certified Salesforce Consultants which includes Salesforce Architects, Certified Developers, Business Analysts and Salesforce Administrators. Salesforce Implementation, Complex Customisations, Development, Integration and Salesforce Support are just a few of the specialisations offered. In Australia Girikon can be contacted on toll free number +61 1300 332 888 or at Level 1 & 2 161 Collins Street Melbourne. Headquarters at Phoenix, USA 15433 N Tatum Blvd #105, Phoenix, AZ 85032, USA and can be contacted at +1 480-382-1320. Visit www.girikon.com for further details on Girikon’s Quality Services.